You may be interested in my earlier post on my mother’s touching and dignified death called We Are Always Connected. Perhaps the most profound reason for our intensely consumptive lifestyle is, at bottom, our fear of death. “You can’t take it with you,” as they say – though you can try to numb the terror with the things that money can buy. But in his purposeful death by fasting at the age of 100, Scott Nearing demonstrated that there are better, simpler choices. Throughout their lives, Helen & Scott Nearing were a living example of the possibility of such choices. Their experience, memorialized in Living the Good Life and a string of other books, has been an inspiration to thousands of people looking for an alternative to modern industrialism. On their homesteads first in Vermont and later Penobscott Bay, Maine, the Nearings built, made, grew and collected nearly everything they needed. Yet they still found plenty of time for nourishing their inner lives and giving to others – through music, education, writing and speaking. Here Helen Nearing, who still lives at the Maine homestead, recounts the story of Scott’s purposeful passing. 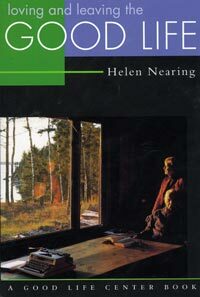 For more information about the Nearings’ rich-yet-simple lives and their many books, write to Social Science Institute, Harborside, ME 04642. Doctors practice medicine. Scott and I intended to write a book together, We Practice Health, which never eventuated, though we wrote much on the subject in various chapters of our homesteading books Living the Good Life and Continuing the Good Life. We rarely if ever used doctors, pills, or hospitals. Yet Scott lived to a hale and hearty 100 and died when he decided to – by fasting for a month and a half at the very end. He had always been physically active, in the woods, in the garden, in building construction. He was also active mentally, having written 40 or more books from his 20’s to his 90’s, including an autobiography, The Making of a Radical. “Work,” said Scott, “helps prevent one from getting old. My work is my life. I cannot think of one without the other. The man who works and is never bored, is never old. A person is not old until regrets take the place of hopes and plans. Work and interest in worthwhile things are the best remedy for aging.” Still, he was facing the end and knew it. Most people begin to get old in their 60’s. Scott only began to be old in his 90’s. Up to then if anyone called him old I was outraged, because he neither looked nor felt old. Sure, he had plenty of wrinkles. They came in his 50’s from a lot of hard work in the sun. But failing and getting feeble? No. He did more than his share of mental and physical work up to his last years. At 98 he said “Well, at least I can still split and carry in the wood.” And when he was close to the end, lying in our living room, his one regret at leaving this Earth plane was on watching me lug in the wood for our kitchen stove. “I wish I could help with that,” he said. He was a help unto the end. So I put Scott on juices: carrot juice, apple juice, banana juice, pineapple, grape – any kind. I kept him full of liquids as often as he was thirsty. He got weaker, of course, and he was as gaunt and thin as Gandhi. Came a day he said, “I think I’ll go on water. Nothing more.” From then on, for about ten days, he only had water. He was bed-ridden and had little strength but spoke with me daily. In the morning of August 24, 1983, two weeks after his 100th birthday, when it seemed he was slipping away, I sat beside him on his bed. In a soft voice, with no quiver or pain or disturbance he said “All…right,” and breathed slower and slower and slower till there was no movement anymore and he was gone out of his body as easily as a leaf drops from the tree in autumn, slowly twisting and falling to the ground. So he returned to his Maker after a long life, well-lived and devoted to the general welfare. He was principled and dedicated all through. He lived at peace with himself and the world because he was in tune: he practiced what he preached. He lived his beliefs. He could die with a good conscience. As to myself and my old age: I try to follow in his footsteps. It is not so easy homesteading alone, but I carry on. A few more years and I also will experience the great Transition. May I live halfway as good a life and die as good a death.